Involuntary Hospitalization presentation copyright 2014 by Hollis Easter. All rights reserved. 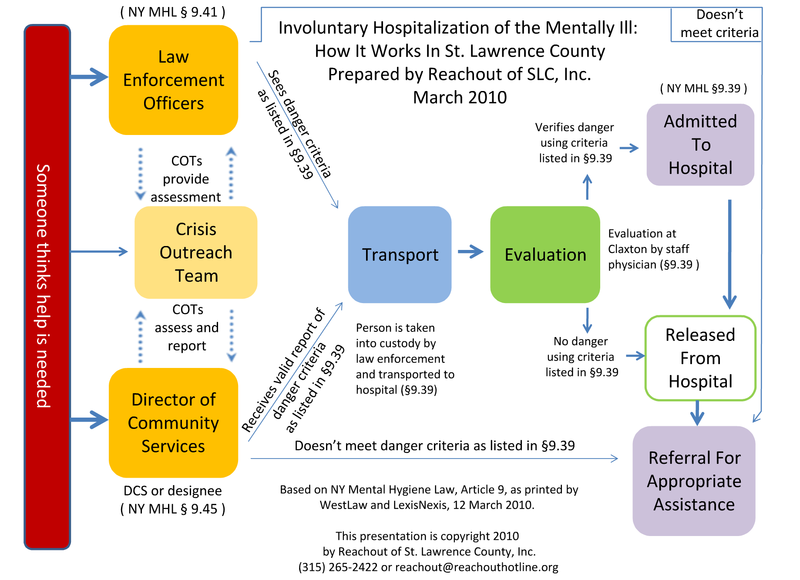 Several years ago, I was asked to help explain how people get sent to psych hospitals involuntarily in NY, whether for suicidal thoughts or homicidal behaviors. It turns out that a lot of people are uncertain about which laws apply, how they work, and what they do. The same questions often come up when I’m teaching people about suicide prevention or suicide intervention, because someone usually says “just send ’em to the mental hospital!”. It’s not that simple. New York’s Mental Hygiene Law Article 9 covers hospitalization of the mentally ill. It’s a long and somewhat challenging read, and most people’s eyes glaze over pretty quickly. Moreover, much of what’s in Article 9 never gets used in small rural counties like mine because we don’t have the relevant facilities or specialists. But this is important stuff. Involuntary hospitalization involves depriving people of their liberty in order to protect them, or society, from immediate harm. It’s a safety valve the law allows for dealing with emergency situations. But we shouldn’t take it lightly, and it’s essential that people follow the laws when invoking it. So I made this presentation. It uses instructional design principles, and it ought to help make this complicated subject more clear. I believe strongly in the importance of finding stories to tell about the material we’re teaching, and I hope I’ve given you some pathways into understanding the provisions of NY’s Mental Hygiene Law. Because of this presentation, I was honored by the Association for Educational Communications and Technology (the national professional organization for instructional designers) with their NSU Award for Outstanding Practice by a Graduate Student in Instructional Design. Thanks, friends! I built this presentation during my fifth week in graduate school, so I’ve learned some more things since then, but I’m still proud of it. In the years since I made the video, Ruth Ayen has retired as Director of Community Services in St. Lawrence County. The phone number remains the same, so if you need help with a pickup order, call and ask to speak to the current DCS. I’m not an attorney. I work in the mental health system and interact with involuntary hospitalization procedures for my job, but I am not an attorney and you shouldn’t consider this legal advice. If you’re using this presentation for training or guidance, you should seek legal counsel to make sure you’re choosing well. This is amazing Hollis. Thank you so much for sharing. I am going to try to make something similar for our training here in Harris County. You rock! You’re welcome, Jennifer! If you need or want instructional design help on it, let me know. I haven’t done any Texas consulting yet but it’d be fun to work together!